A flight over the Pioneer Mountains on Monday gave county commissioners and media members a bird’s-eye view of the mountain range, above. The flight was provided by Ecoflight, a nonprofit group dedicated to providing flights free of charge for conservation groups. Express photo by Katherine Wutz. The sun shone over the Pioneer Mountains and Little Wood Reservoir on Monday morning, illuminating the last of the south-valley snowpack and a landscape that ranges from lava flows to rugged peaks. Bruce Gordon, founder and pilot for the nonprofit environmental flight organization Ecoflight, took two Blaine County commissioners and members of the media on a guided tour of the Pioneer Mountains on Monday. Mike Stevens, president of Lava Lake Land and Livestock, said the goal of the flight was to show the diverse and unique landscape of the region as well as show the need to protect it. Stevens is co-founder of the Pioneers Alliance, a coalition of ranchers, farmers, local residents, conservationists and agency officials dedicated to cooperating for conservation in the Pioneer Mountains. 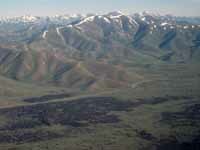 During the flight, Stevens pointed out features such as the lava flows at Craters of the Moon National Monument southeast of Carey, Laidlaw Park, Blizzard Peak and the Fish Creek drainage. From the air, the distinctions between sagebrush steppe, lava rock and mountains became sharper, and the vast scale of the relatively untouched sagebrush habitat, refuge for species such as the pygmy rabbit, became even more apparent. The area is a "stronghold" for sage grouse, Stevens said, as well as a key migration corridor for pronghorn antelope. "When people talk about preserving intact landscapes, it's hard to see that when all you can see are parcels divided by roads and covered with cheat grass and knapweed," Commissioner Larry Schoen said. He said the flight allowed him to see how much intact habitat there is in the county. However, Stevens said, management and conservation efforts are complicated by the patchwork of ownership that checkers the region. "When you look at the landscape, you're looking at one river system," he said, but land surrounding the system is managed by the BLM, the U.S. Forest Service and private ranchers. Some of the private land is protected by conservation easements held by Lava Lake Institute as well as the Nature Conservancy, further complicating jurisdictions. "It was amazing to see the collaboration that's gone into conservation, to see, OK, that's private and that's public, but it's all one landscape," Commissioner Angenie McCleary said. Gordon said Ecoflight raises funds to provide the flights free to conservation groups. The intent is to help bring large-scale land issues such as beetle infestations, oil drilling and strip mining into perspective.